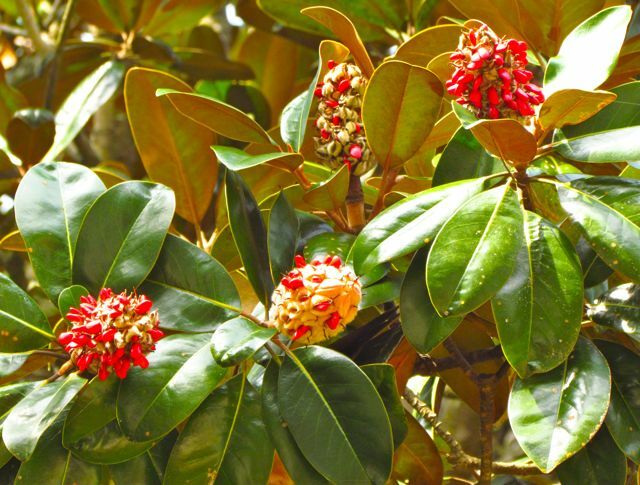 The Southern Magnolia (Magnolia grandiflora) in our front yard is about 40 feet tall. It was there when we moved in 23 years ago, growing taller and wider all the time. In May, the heady perfume of paper-white blossoms beckons bees from miles around. 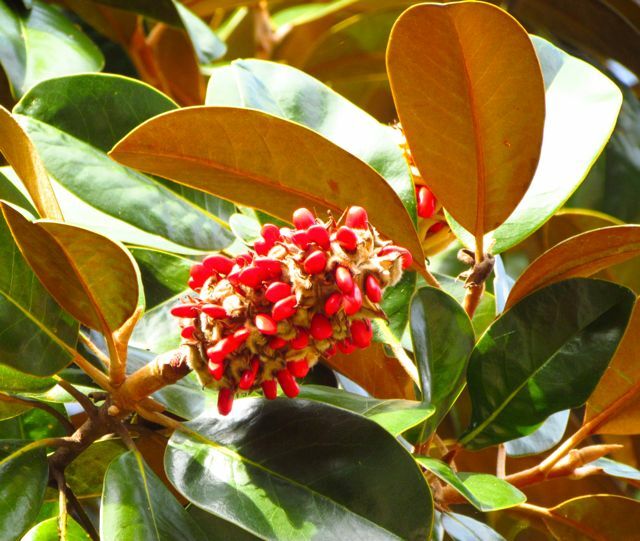 The tree hums, fertilized flowers drop browned petals, leaving fattening seed cones to ripen. In late October, the seed cones open to dangle scarlet fruits on gossamer threads. And then the fun begins. Just as potent a signal as the spring fragrance of the flowers are the gaudy fruits that adorn this tree in fall. Every fruit-loving animal in the neighborhood stops by when the plump red fruits are ready. Squirrels, possums, and raccoons all take their share, but many of the cones dangle at the end of branch tips too thin for mammals. These cones are for the birds. Dangling from the ends of most branch tips, ripe cones beckon the winged ones. Tufted Titmice and Chickadees chatter constantly as they cavort from cone to cone. They are often joined by warblers in dull winter plumage, making them harder to identify as they flit in the shadows cast by the Magnolia’s thick evergreen leaves. Woodpeckers — Red-bellied, Downy, Hairy, and the most raucous of all, Pileated Woodpeckers all stop by often, feasting messily on the Magnolia’s abundance. 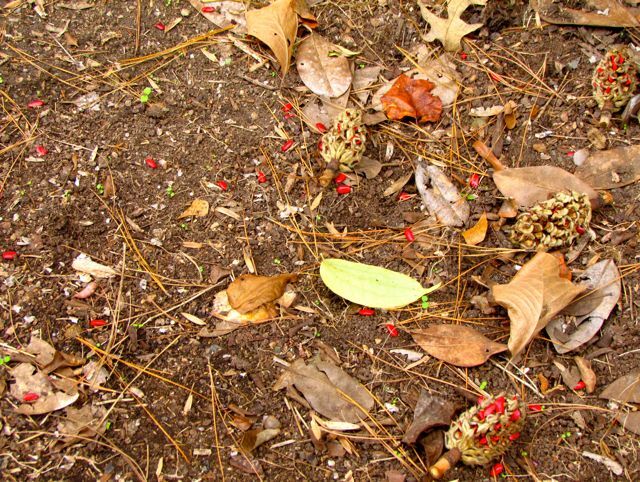 The ground beneath the Magnolia is littered with fallen cones and dropped fruits. When the Blue Jays want in on the action, they loudly imitate the call of the Red-Shouldered Hawk. Not wishing to take chances, the little birds all fly to deeper cover, giving the crow-sized jays easy access to the good eats. Flocks of migrating robins settle onto our property for several days at a time, alternately feasting on the tree, splashing in the bird baths, and resting high in newly bare branches of forest canopy trees. 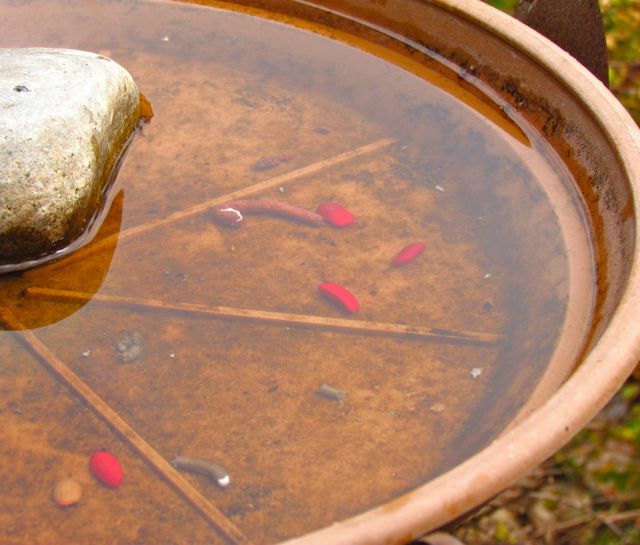 Migrating robins have a habit of dropping fruits (and feces) in the bird baths. This week, I’ve noticed three bird species I only see during late fall and winter. The Yellow-bellied Sapsuckers started hitching up and down nut trees, tulip poplars, and magnolias about three days ago. These members of the woodpecker clan stay all winter, and we usually have several residents throughout this season. The Dark-eyed Juncos showed up at the same time as the sapsuckers. This is unusually early for this species. I usually don’t see them until winter cold settles in for good — early December at the earliest. And most unusual of all — Red-breasted Nuthatches are appearing at the feeders! We don’t see these lovely little birds every winter. Usually they only appear during profoundly cold winters full of deep snow, when our bird feeders become key to the survival of many feathered friends. I was stunned when I spotted one yesterday on the platform feeder dining on safflower seeds. Although it’s been unseasonably cool here, it certainly isn’t truly cold, and the only early snows are in the mountains west of us. I think perhaps the northern migrants arrived early because of Hurricane Sandy. The after effects of this massive super storm that devoured the eastern seaboard last week are still causing much suffering in the northeastern US. Wonder Spouse and I have sent our donation to the American Red Cross, and we encourage everyone else to do the same if they can. Folks up north are going to need extra help for some time to come, especially with an autumn nor’easter heading their way later this week. It’s easy to forget about the wildlife when human suffering is so evident. But those downed trees and drowned wetlands mean death and displacement to many birds and mammals. I think the birds that weren’t destroyed by the storm are opting to fly south ahead of their normal schedules, seeking havens in the southlands, where food and shelter remain fairly abundant. It’s times like these that I am glad I’ve worked hard for two decades to enhance wildlife habitat — food and shelter — on our five acres of North Carolina Piedmont. Avian refugees are welcome to stay as long as needed. Feeders will remain stocked; bird baths will stay clean and full. For every falling leaf of scarlet and gold, we send forth prayers for the recovery of humans and wildlife in devastated areas of the northeast — and anywhere else in the world where suffering prevails. This entry was posted on November 4, 2012, 4:50 pm and is filed under Native Wildlife, piedmont gardening. You can follow any responses to this entry through RSS 2.0. You can skip to the end and leave a response. Pinging is currently not allowed.